Do the Cubs Have a Short-Term Lefty Shortage? When minor league rosters were first announced, one of the strangest things I noticed was that the Tennessee Smokies did not have one single left-handed pitcher on the roster. That was pretty hard to miss. At the same time, South Bend mustered two lefty starters and one in a relief role who has already spent time on the 7-day DL last week. The lack of lefties in the minors does seem to be a bit strange considering their high value to the major league club. At the major-league level, the Cubs have Jon Lester and Jose Quintana as left-handed starters and they have plenty of help in the bullpen with Justin Wilson, Brian Duensing, and Mike Montgomery. AAA Iowa currently has four lefties in starter Michael Roth and relievers Rob Zastryzny, Alberto Baldonado, and Randy Rosario. In total, the Cubs have about 30 left-handed pitchers in the entire system. Myrtle Beach and Chicago account for 10 of the 30 left-handed pitchers which leaves almost 20 spread across the other 8 teams. The shortage of lefties might not be a big deal right now, but it could be if something happens at the big league level. Who Could Help This Year If Needed? While the Cubs did select lefty Brendon Little with the first pick in the 2017 Draft, Little is far from a polished prospect. Rather, he might be more of a project that pays off much later. His ability to get to Chicago depends on a few years of development. If lefty help is going to come this year, Zastryzny will like more than likely be the first name called up for the bullpen. In Iowa, all Zastryzny has done is to come out of the pen and not allow a run in 5.1 IP this year and has struck out 5. That’s a good beginning for him. I did find it surprising that Roth made Iowa’s starting rotation. So far, he’s made 2 starts and has not allowed a run over 9.2 innings while striking out 8. As for Randy Rosario, he’s only 23, which I find to be amazing, and he could be a steal and a long term piece for the pen. The Cubs control Rosario through 2023, the same as Zastryzny. So far, Rosario has not allowed a run in 3 appearances for Iowa. He might be the most intriguing arm to watch. Then again, Rosario, who appeared in 2 MLB games last June, did so with disastrous results as he allowed 8 runs in 2.1 innings. As for Baldanaldo at Iowa, … it’s not going well at Iowa. Another lefty, Kyle Ryan, is in Arizona in extended spring training and will likely be assigned to Iowa at a later date. Ryan spent two full years being successful in the majors for the Tigers before struggling last year with an ERA over 7. Ultimately, in the short term, the odds are not ideal for lefties in the system. On the other hand (pun intended), depending on the need and impact of a lefty needed at the major league level, the Cubs could go and get one via the trade market this summer. The aforementioned lefties from Iowa would be fine for a short DL stint or two. But if a loogy is needed for the season and the playoffs, expect the Cubs to go and get the players they need like they have done in the past. The odds for developing lefty pitchers are much better in the long-term. Here are a few names of some lefties, other than Little, who might be worth watching this summer. Bear in mind, none of the following names will not make it to Chicago this summer or even next year. Tyler Thomas – The 6’ and 175 pound lefty out of Fresno State has dazzled in his first two starts for South Bend this year, including throwing five innings of no-hit ball against Bowling Green. Armed with a low 90s fastball and a beautiful changeup, Thomas works at a quick pace keeping everyone on their toes. He was one of the top collegiate pitchers in 2016, but struggled a bit in the spring of 2017 at Fresno State. However when he came to Eugene, he was lights out in a relief role (24 Ks in 19.1 IP). Brailyn Marquez – He just turned 19 in January, but at 6’5”, he is still growing into his frame and can throw in the mid 90s. 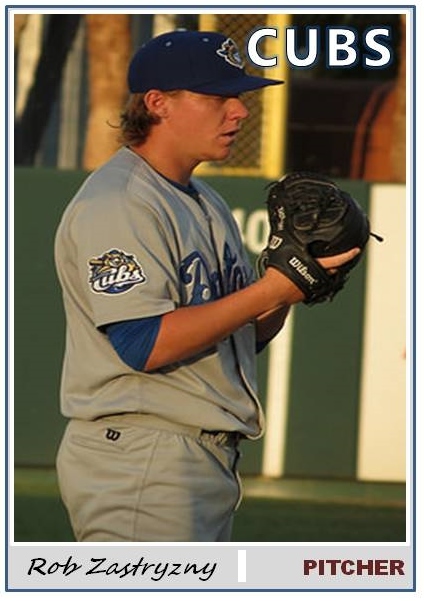 He played last year at Mesa and struck out 52 batters in 44 innings. The issue was not that he walked just 12 guys all summer, rather it was that opponents hit .275 off him. His secondaries are a work in progress. Marquez should be at short season Eugene which starts play in the middle of June. Bryan Hudson – His first start in 2018 didn’t go so well for Myrtle Beach but there’s plenty of time to recover. On Saturday, in his second start, he went 5 IP and struck out 4 but gave up 3 runs. The 6’8” 220 pound 20-year-old is improving gradually every year. He was a ground ball machine at South Bend in 2017. For his career, he has averaged 2.96 ground balls to 1 flyout. His curve/slider used to be his calling card, but now it’s his ability to get guys to beat the ball into the ground with his fastball as well. Justin Steele – He had his best season as a Cub in 2017 with an ERA of 2.92 for Myrtle Beach. However, he wound up having Tommy John surgery in August. He’s not gonna come back to pitching as a starter this year, but hopefully he can be seen tossing the ball around in Mesa in August. I highly doubt if he gets in any games. He should be back on track to pitch at AA Tennessee in 2019. What most impressed me about Steele last year before the injury was a new mental focus. Steele credited to the Cubs’ mental skills program that involved meditation for a lot of his success. Steele is an arm who could relieve, or he could also start. He is still just 22.